Another happy visit to Norwest Private Hospital and I continue to be amazed at the level of care and guidance offered by the midwives to new families in the nursery. The nursery is always full of happy families, learning skills they will need to look after their baby at home, with the full support and care of the midwives, if they have a question, or don't know what to do next. This nursery is one of the only ones I have seen where several families can come in at the same time and do things together or separately, in a relaxed and supported environment. Norwest is a beautiful, state-of-the-art hospital with lovely waiting areas for guests and facilities for patients. We are proud Look@MyBaby is part of the latest in maternity care. 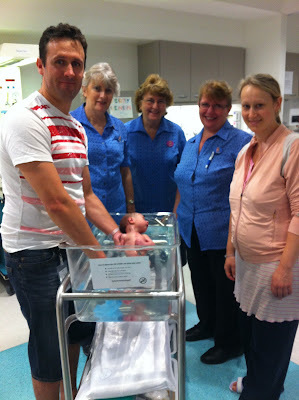 As always Beth, Margot, Ros, Barb, Stacey and all the other midwives were fantastic and helped me around the hospital. Every maternity room is full and there's a big focus on family at Norwest. As I was leaving I ran into Harry and his grandma, Sue, who were on their way to meet Harry's new baby brother, Michael. Harry brought in some special stickers for his brother. Thanks Harry and Sue for telling me about Michael. 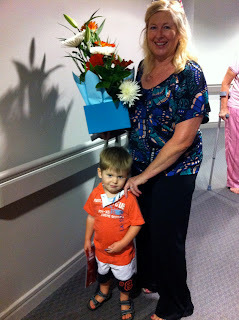 And thank you to all the staff at Norwest, who make my visits so enjoyable.